Your Divorce Options – What You Need to Know! 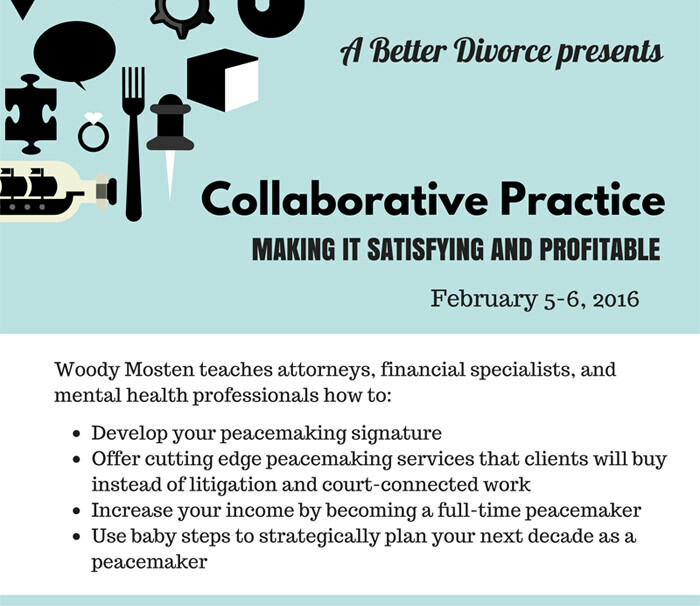 Do you know someone who is considering divorce and wants to learn about process options? Please recommend that they attend an informative workshop called “Divorce Options” at the Torrance Courthouse Law Library from 12:15 to 1:30 on the third Friday of each month. Guests can attend this workshop even without preregistration. See Flyer for more details. The program is presented by members of A Better Divorce and LACFLA– family law attorneys, mental health and financial professionals who specialize in divorce and related issues. While I have been honored to offer trainings in many communities, my two days with A Better Divorce is one of the highlights of my career. Knowing that no one is a prophet in one’s own land, I was very nervous about offering a training in my own community with colleagues whom I respect and with whom I work frequently. My anxiety was wasted as I cannot remember learning more or having a better time than with my friends of ABD and other local peacemakers. The level of conversation was on a high level and ABD members demonstrated a sophisticated and nuanced understanding of collaborative strategies that was most impressive. Even though the group was quite advanced, they displayed the finest qualities of peacemaking: an openess for self-reflection and to examine the way that they have long successfully practiced. Finally, I wish to commend Jane Euler, Kim Davidson, and Joe Spirito for their countless hours in tirelessly arranging the training. Every thing was planned, operational, and the food was beyond outstanding! Anyone who has ever trained knows how important this support can be. I not only look forward to training again with ABD, but most importantly, working with ABD members on Collaborative and Mediation cases to help families resolve and heal. 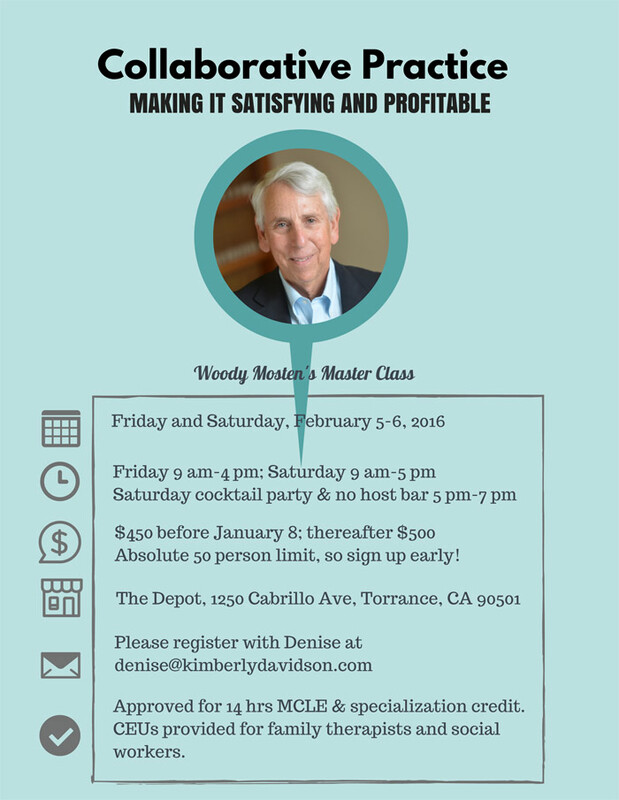 A Better Divorce attorney member Chris Moore spoke at the University of Southern California, Tax Institute in Los Angeles on January 27, 2016. Getting a divorce is among the most challenging and trying times of a person’s life. Divorcing couples can spend thousands of dollars and give up many years of their lives to the traditional divorce process. By the end, the parties come out the other side drained and bound to decisions made by a third party judicial officer. Couples looking to avoid such a public and adversarial process are increasingly utilizing collaborative divorce, which allows couples to settle the terms of their divorce confidentially and entirely out-of-court. The end result is that the parties can sign a settlement agreement with terms they actually created rather than terms determined by a judge. Collaborative divorce is typically much less money than a contested divorce and unsurprisingly, it’s rapidly gaining momentum across the country as the preferred alternative to the traditional divorce process. Many states, including California, have now enacted laws formally enabling and facilitating collaborative divorces. Unlike in litigation, spouses typically utilize joint professionals, such as financial experts, child psychologists, custody evaluators and therapists. The goal of the involved parties and professionals is a cooperative resolution in the best interests of the family’s future. So how does it work? Each party retains a collaborative attorney. The couple and their attorneys then sign an agreement that they will not litigate and will reach a fair settlement directly. However, at any point either party can opt out, retain new counsel and pursue litigation. But if the spouses do continue with the collaborative process, they must agree to communicate openly and work with one another and their attorneys to facilitate the process. All involved parties work together as a team, emphasizing cooperation and respect over animosity and confrontation. Though this process may sound like mediation, it is not. In mediation, parties submit to a single, neutral third party. The mediator then works toward a mutually agreeable decision. However, a power imbalance between the parties often exists and yet they proceed without counsel. In a collaborative divorce, spouses craft a settlement agreement with the benefit of their own legal advocate to help them. Herein lies the beauty of a collaborative divorce: The spouses control their own destiny. The parties can come up with creative settlement terms and custody arrangements tailored toward their own unique circumstances that a judge or mediator may not otherwise make. So in many cases, this means a quicker and less expensive divorce with terms that are likely to be successful in the longer run because the parties invested time and effort into creating them. Joseph P. Spirito, Jr. Esq. of McGaughey & Spirito is a practitioner and instructor of collaborative divorces. Don’t make changes to your existing life, auto, health or other insurance policies, unless you have your spouse’s written agreement. This includes changing deductibles, carriers, insureds or beneficiaries. Don’t unilaterally tell your children you are getting a divorce. It is usually better for parents to share this information as a team. Your children do not want to take sides or be in the middle. Instead, use this opportunity to reassure your children that you both still love them, and that the divorce is not their fault. Don’t “trash” your spouse to family, friends, and especially your children. Never assume your children cannot hear you or that information you share in confidence won’t get back to them or to your spouse. This includes Facebook, folks! Don’t drown your sorrows with alcohol. Allegations of excessive drinking may be used against you in a custody dispute. 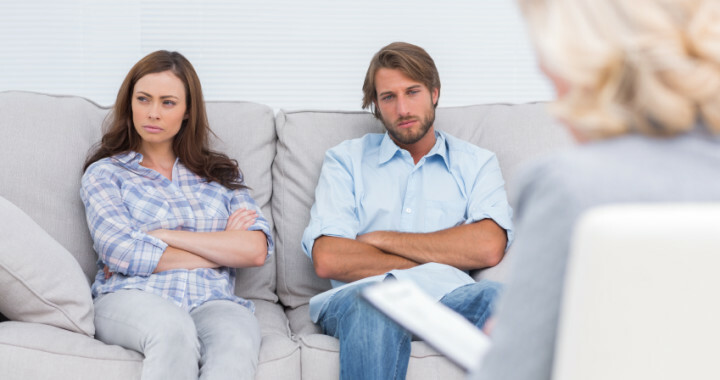 Many divorcing people suffer from emotional turmoil – anger, depression and other difficult feelings. By all means get help from family, friends and/or professionals. When in doubt, behave toward your spouse as you want your spouse to behave toward you. That’s the bottom line. Deborah Ewing, Wendy Jones, and Elaine Thompson are all experienced family law attorneys in the Los Angeles area, and are members of A Better Divorce, a Collaborative Family Law Practice Group. When was it, and why does it matter? The date on which one or both parties clearly communicate to the other their intent to end the marriage. - Are the spouses still living together? - Are they sharing finances? - Have they told anyone they are separating/divorcing? - Are they still acting like a married couple in public? - Are they still having sexual relations? - Has either spouse changed his/her mailing address? Spouses may not agree on their date of separation. They may each perceive the situation differently or have a different recollection of events. When spouses disagree on what the date of separation is, it becomes a matter to be determined later, either by agreement or by a Judge. - The “length of the marriage” is determined by the date of separation, not the date the divorce becomes final. The length of the marriage can have an impact on such things as spousal support and social security benefits. o Each spouse’s earnings belong to that spouse. o New debts incurred by a spouse belong to that spouse. Before your first appointment with a lawyer, it will be useful to think about your situation and the circumstances which might help determine your date of separation. It should be noted that people frequently claim that they are “legally separated.” Usually they are mistaken. The concept of legal separation has nothing to do with the date of separation. It is a separate and unusual legal concept, and a true “legal separation” requires an order signed by a judge. Divorce can be overwhelming. One of the things people may overlook is the importance of documents. Verifying the nature and extent of income, assets and debts, reimbursements and credits, and other details of divorce requires documents. Getting copies of the documents you will need now, will streamline the divorce process and may reduce the cost of divorce later. Income tax returns for the last three to five years, particularly if income varies, or businesses or self-employment are involved. Include all attachments, W-2s, and 1099s. Paystubs for you and your spouse for at least three months, showing all deductions from pay. Most recent statements for all financial accounts (checking and savings, certificates of deposit, money market and other investment accounts). Most recent statements for all retirement plans for both of you, including pensions, 401(k) and similar retirement savings plans, stock savings plans, IRAs, and annuities. Most recent statements for all mortgages and equity lines. Most recent statements for all credit cards and other outstanding debts, including auto loans. Any documents stored in a safety deposit box. Any documents relating to assets which you acquired prior to marriage or as a result of an inheritance or a gift of substantial value. Any premarital/prenuptial agreement and any other written agreement between you and your spouse. Rather than taking the originals, make copies of the important documents, and leave the originals in place. Nothing would be worse than your spouse opening the file cabinet only to find it empty! Whether your divorce proceeds as a collaborative or mediated case, or as a full-blown litigation case, acting in good faith will always serve you well. Don’t keep the copies in your car trunk. If the documents disappear, all your efforts would be wasted. Put your copies in a safe place until you obtain counsel. o No two divorces are the same – just as no two couples and no two families are the same. In a divorce, the differences matter a lot. o “My friend receives/pays $7,500/month in spousal support!” Maybe so, but that is no indication of what will happen in your case. Yours and your spouse’s age, financial situation, work history, education, length of marriage, health, and a host of other factors, will influence how spousal support is determined, whether by settlement or in a Court setting. The details of the amount, duration, and whether support will even be ordered are complicated and will vary widely. It is impossible to know at the beginning what the outcome will be. o “My friends tell me 50/50 custody is the law.” The phrase “50/50” is often heard in conversation; however, the reality is much more involved. There is no cookie-cutter approach to custody. The schedule that works for another family may be totally different than what would work for your family. Such factors as the ages of your children, geographical distance between households, work schedules, special needs, sports and other activities, and the relationships you have with one another will all play a part in determining the best plan. o “I heard I get half of everything…right?” Well, maybe. The division of your assets and debts is directly affected by the details. 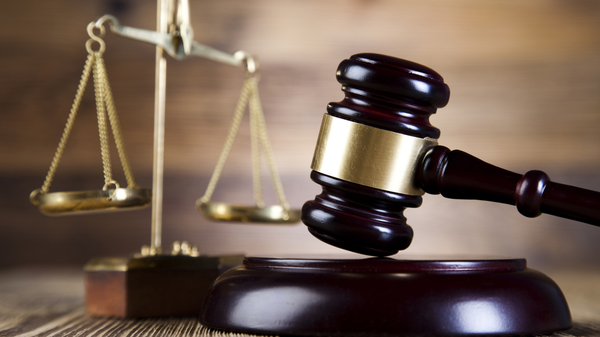 The law on property division is fact-driven and the smallest differences can matter greatly. Inheritances, separate property before marriage, changes in title, property loans, student loans, when property was acquired and debts arose, gifts to or between spouses, business interests, and many other factors must be considered before the final division is made. - Your life after divorce may not be what you’ve envisioned. Careful consideration of a decision as big as this one is critical. Just because your friend or relative got a result that looks tempting to you is no guarantee that the same thing outcome happen for you. The documents are signed, the Judgment is filed with the court, you are officially “divorced.” Now what? - Don’t throw away the Judgment – ever! Years later, you may need to provide proof of your divorce (including a copy of the Judgment and Notice of Entry of Judgment) for any number of reasons, including remarriage, adoption, home loans, and Social Security benefits. It is also wise to hold on to copies of the “Disclosure” documents you exchanged with your former spouse, particularly the Schedule of Assets and Debts, and Income and Expense Declaration. Don’t throw away your tax returns as long as there is an order for support. o Close joint bank accounts and credit cards and transfer any funds required by your agreement. o Notify insurance companies of the divorce, so that arrangements can be made to separate or establish new policies (auto, life, health). o Change title on vehicles and real property. o Make sure that the documents necessary to divide pension and other retirement plans and IRAs are prepared and processed now. o Make sure to change, if you wish, the beneficiaries on accounts and insurance policies. See an estate planning attorney to talk about your new plans. - Keep records of payments It is much easier to avoid conflicts and misunderstandings later on if you are able to go back and show records of what happened. Whether you are the person paying or receiving money, this is equally important. o You and your former spouse may have agreed to share the children’s medical costs. If so, develop a system now for requesting reimbursement from the other parent. Once a month, make copies of any medical, prescription, dental, vision or other agreed-upon costs you have incurred which were not covered by insurance. Submit copies to the other parent showing what you paid, with a short (polite) cover note requesting reimbursement for their share. Email is a good method for doing this if you have easy access to a scanner. Print out the email or copy the note and put it with your receipts. When you receive reimbursement, make a copy of the payment you receive. If you are the one paying the reimbursement, keep copies of what you have sent. If you don’t receive reimbursement on time (usually 30 days), send a brief (polite) follow up. If you do not request reimbursement and provide copies to your co-parent, you may not be able to recover those funds later. You really are ready to start the next phase of your life. With a little time devoted to organization and planning now, you can more easily put this behind you and move forward with confidence.